One assumes this will be one of the most eagerly sought after beers of the year. 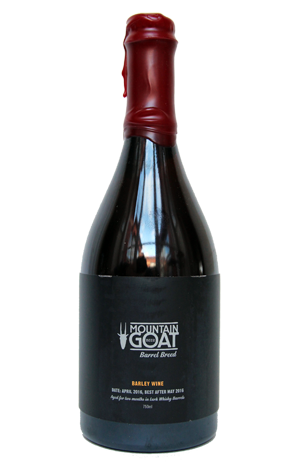 Last year, Mountain Goat secured a number of Lark Distillery whisky barrels and the first beer that spent time in them was an English style barley wine. What came out to be blended at the other end of the incubation period was by far the booziest beer the Richmond brewery had ever released and also, according to the judges at last year's Australian International Beer Awards, the best Australian beer of the year. So, having extracted all the whisky goodness they could from the original barrels via two subsequent Barrel Breed releases (Imperial Stout and Christmas Ale), they obtained some new ones and set about creating the follow up. The beer spent a couple of months in said barrels, going in at 8.9 percent ABV and coming out at 11.3 – not has massive as the original but, we think you'll agree, pretty sizeable in beer terms. Barley Wine Mk II has been released just in time for this year's beer awards and is a worthy successor too. Smooth, rich, subtly complex and remarkably un-boozy for its size, it possesses a seriously enticing auburn glow and unveils all manner of luscious toffee, caramel, stewed fruit, vanilla and sherry characters. There's more than last year, but we'd still suggest you move fast to secure a bottle.